ETS for Plants - Perelandra Ltd.
ETS for Plants is for family gardens, houseplants, forests, truck gardens, patio plants, landscape plants, bushes, shrubs, pond plants. . . . Anything that falls within the category of plants. It can be used as part of a plant's general balancing, as well as for those times when plants experience stress from weather extremes or pollution, and serious insect infestation or disease. We use it with our seed starting process. The seedlings are noticeably more robust and they grow more quickly. As the plants are potted up, this ETS prevents the usual shock plants experience when shifted from one pot to another. ETS for Plants addresses a plant's balance from within the very core of its structure. ETS for Plants can also be used for larger plant environments such as field crops, large commercial gardens, greenhouses and forests. Drops can be added to watering cans and applied directly to soil, or it can be added to water in sprayers for a foliar application. An instruction brochure is included. NOTE: ETS for Plants does not directly repel insects. It strengthens a plant so that the plant itself is not vulnerable to insects and, therefore, acts as its own repellant. It also is not a herbicide. 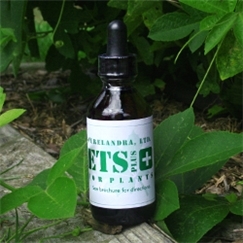 If you use it on a wild plant or a plant you consider to be a weed, ETS will balance and strengthen that plant. Do not mix ETS with fertilizers. It should be applied in a plain water solution. (However, in order to foliar feed an ETS mixture, you will need to add a little liquid soap in the sprayer tank in order to soften the water and get a good leaf coverage when you spray. The addition of the soap will not interfere with the ETS for Plants/water mixture.) If you wish to also foliar feed using a fertilizer, you will need to do a second application. It does not matter which you do first — the ETS application or the fertilizer foliar feeding. If a plant is in distress, plan to apply ETS once a week. Do this until the problem or concern has passed — i.e., the insects have moved on, the weather has stabilized, the plants have repaired, potted up or transplanted plants have stabilized, etc. For general strengthening as a preventive measure, apply ETS for Plants once every 3-4 weeks throughout the growing season. Regular watering and foliar feeding for large areas will be impractical. (Actually, it would be ridiculous.) So for plants growing on this scale, you may use ETS for Plants by releasing it to the area using a process called "n.s. application." This is a "high tech" nature process and requires you to work in partnership with nature. You will offer the correct number of ETS for Plants drops and nature will shift the essence and electrical pattern of those drops to all the plants/trees in the area you are working with. It sounds magical, even a bit outrageous, I know. However, if you are brave of heart and don't mind trying something totally new, this is the adventure for you. Think about it: If you have a corn field that is being destroyed by disease or insects or that corn is being stressed by extreme weather conditions, you have nothing to lose by using this process to apply ETS for Plants. So give it a shot. Your biggest problem will be dealing with how to think about the results you will see within a few days after you apply ETS to these plants. And you'll have trouble explaining it to your friends. We have set this n.s. application process up so that anyone may use it, whether they are familiar with and using the other Perelandra processes or not. You will need a spoon, watch or clock with a second hand, paper and pencil/pen. Focus on the area to be treated with ETS for Plants. If the area has an identifying name (such as "north field," "south garden," "strawberry rows," "corn field," "pumpkin patch," "the lower orchard," etc.) think of this while you are focusing. You'll need to visualize or think about the entire area you wish to work with. It may be helpful to sketch out the boundary of the field, forest or area, or the section of the orchard or vegetable rows. Place 12 drops of ETS for Plants in the spoon and hold the spoon out in front of you. Say, "I would like the essence of these drops to be shifted to ___________ (name of area)." Continue holding the spoon out for 10 seconds. That's it. Now watch for results. If a field, forest or area is in distress, plan to apply ETS for Plants once a week. Do this until the problem has passed — i.e., the insects have moved on, the weather has stabilized, the plants have repaired, the harvest is complete, etc. For general strengthening of an area as a preventive measure, apply ETS for Plants once every 3-4 weeks throughout the growing season. Perelandra ETS for Plants has been created by nature from a combination of electrical infusions from 133 different plants, minerals, natural gases and elements found in the sea, atmosphere and on land. During the production process, Machaelle works with nature to combine the components needed. In the first phase of the process, nature restores each element back to its original state of balance, thus eliminating any damage that has been caused by environmental breakdown and human interference. This allows ETS for Plants to be made with balanced and "clean" ingredients. In the next phase of the production process, the balanced electrical patterns for each of these 133 elements are combined. The somewhat explosive result is a completely new, single, complex electrical pattern that has as its foundation the patterns from all the elements required for ETS for Plants. The electrical pattern for ETS for Plants is then released to and stabilized in water. Brandy or distilled white vinegar is then added as a preservative. ETS for Plants is a natural and organic product and is completely safe. If none of this makes sense to you, just remember that you probably don't understand how your microwave or television works, yet you can use them quite successfully. With ETS for Plants, you may not understand how this thing is produced or how it works but, like the microwave, you can still use it successfully and with excellent results. We guarantee the integrity and potency of the Perelandra Essences and Solutions. 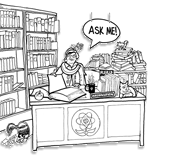 They have an indefinite shelf-life and we preserve them in a brandy or vinegar base to ensure that shelf-life. Sometimes, after a period of time, the rubber bulb on the dropper may show signs of deterioration — softening, collapsing, cracking. When this occurs, we recommend you replace your droppers. To facilitate this, we offer packages of replacement droppers. Of course, we can't guarantee against mishaps that occur due to "user carelessness," such as replacing a dropper before washing it off after it has touched your mouth or having several bottles open at one time and forgetting which dropper went into which bottle. But we certainly back the integrity of the essences in the areas that we here at Perelandra can control.